Compact, well finished 35RF with fast lens, AE and manual exposure. 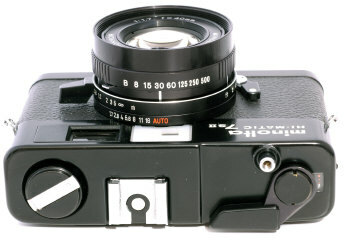 Some Minolta fans believe the 7sII has the same lens as the Minolta produced 40/2 Leica CL, a claim which I found extremely hard to believe considering the price difference. The black paint 7SII is extremely hard to find and very well finished. 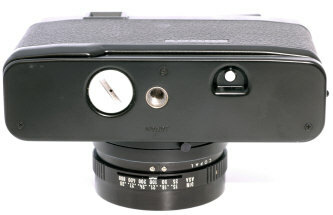 Compact 35 Rangefinder with 40/1.7 lens, focusing to 36"
Manual over-ride, alas with no metering. Flash sync at all speeds, 1/8 to 1/500 plus B. Lens caps serves as ON/OFF switch to save battery current -- no separate switch. The 7sII camera case is well done of quality leather, higher quality than most of its competitors. As a side note, the Minolta 7sII and Konica S3 are so similar in size and features, I can't help but wonder if they had the same designer or even came out of the same factory. Chrome 7sII's far outnumber the black, perhaps by as much as 100 to 1. Not an easy to find camera, at least in the US. NO Guide Number flash control, unlike many of its competitors. NO metering in manual, just like most of its competitors. 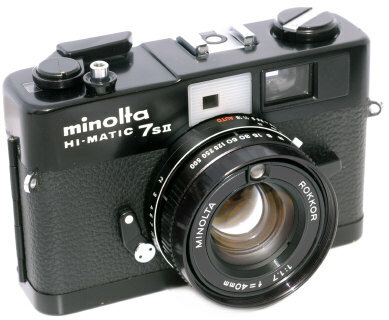 The Minolta 7sII cases are well made and seem to last the years, in contrast to the cases for contemporary Canon and Olympus compact rangefinders which seem to self destruct. 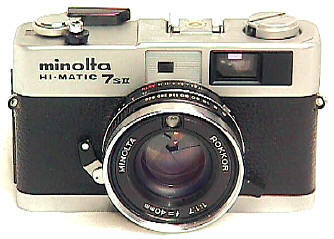 The Minolta 7sII is small, nicely made, and offers both AE and manual exposure. Yet it is an average design of its type with no features to set it apart from its competition. 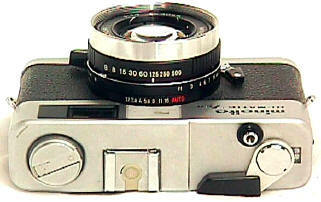 While Yashica, Olympus and Canon sought to compete in this class by adding new features, Minolta instead was satisfied with a well finished camera of average specifications. Revised: February 24, 2005 . Copyright © 1998-2005 Stephen Gandy. All rights reserved. This means you may NOT copy and re-use the text or the pictures in ANY other internet or printed publication of ANY kind. Information in this document is subject to change without notice. Other products and companies referred to herein are trademarks or registered trademarks of their respective companies or mark holders.